§ 297-21 Interpretation of zone boundaries. § 297-22 Lots divided by zoning boundary lines. § 297-23 Amendments to the Official Zoning Map. § 297-24 Computation of time. 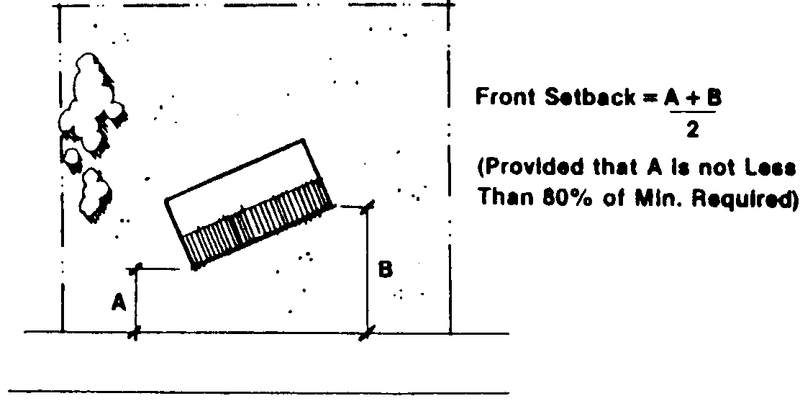 § 297-25 General lot requirements. 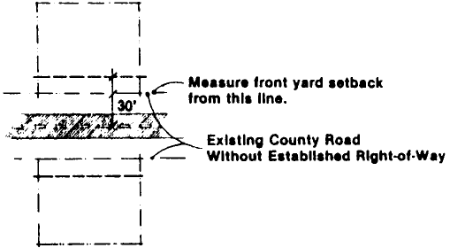 § 297-26 General yard requirements. § 297-27 Exceptions and modifications to minimum height requirements. § 297-28 Visibility at intersecting roads. § 297-29 Accessory uses and structures. § 297-33 Air pollution standards. § 297-34 Disposal of liquid wastes. § 297-35 Electrical disturbance or interference. § 297-36 Hazardous materials storage near railroad tracks. § 297-37 Change in use. § 297-38 Transportation element of Comprehensive Plan. § 297-39 Expiration of home occupation and cottage industry permits. § 297-40 Scenic and/or historic roads. A zone is represented by name in this chapter and by letter combinations on the Zoning Map. Where an area on the map is designated as a certain zone, the zoning regulations pertaining to that zone prevail. 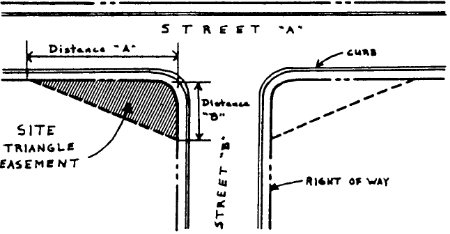 Where a zoning boundary line is given a position within a street, alley, navigable or nonnavigable stream, it shall be deemed to be in the center of the street, alley or stream; if the actual location of such street, alley or stream varies slightly from the location as shown on the Zoning Map, then the actual locations shall control. Where a zoning boundary line is shown as being located a specific distance from a street line or other physical feature, this distance shall control. Where a zoning boundary line is shown adjoining or coincident with a railroad, it shall be deemed to be in the center of the railroad right-of-way. 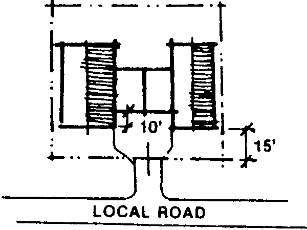 Distances shown as measured from a railroad track shall be measured from the center of the designated track. Where the zone boundaries are not otherwise indicated and where the property has been or may hereafter be divided into blocks and lots, the boundary line shall be construed to be the lot lines; where the zones designated on the map are bounded approximately by lot lines; said lot lines shall be construed to be the boundary of such zones, unless said boundaries are otherwise indicated on the map or by ordinance. In an unsubdivided property, unless otherwise indicated, the zone boundary shall be determined by the use of the scale contained on such map. Whenever a single lot two acres or less in size is located within two or more different zones, the zoning regulations applicable to the zone which constitutes the larger portion of the lot shall apply to the entire lot. Whenever a single lot greater than two acres in size is located within two or more different zones, each portion of that lot shall be subject to all the regulations applicable to the zone in which it is located. Amendments to the Official Zoning Map are accomplished using the same procedures that apply to other amendments to this chapter, as set forth in Article XXVII. The Zoning Officer shall update the Official Zoning Map as soon as possible after amendments to it are adopted by the County Commissioners. Upon entering any such amendment on the map, the Zoning Officer shall change the date of the map to indicate its latest revision. New prints of the updated map may then be issued. No unauthorized person may alter or modify the Official Zoning Map. The Zoning Officer shall keep copies of superseded prints of the Zoning Map for historical reference. Unless otherwise specifically provided, the time within which an act is to be done shall be computed by excluding the day of the precipitation event or decision and including the last day of the time period. If the last day is a Saturday, Sunday or legal holiday, that day shall be excluded. When the period of time prescribed is less than seven days, intervening Saturdays, Sundays and legal holidays shall be excluded. Unless otherwise specifically provided, whenever a person has the right or is required to do some act within a prescribed period after the service of a notice or other paper upon him and the notice or paper is served by mail, three days shall be added to the prescribed period. Separate lot requirements. Except as otherwise permitted by this chapter, not more than one principal building used for dwelling purposes shall be permitted on any single lot; establishment of a building with separate dwelling units for rental, cooperative or condominium purposes on a single lot shall not violate this requirement. 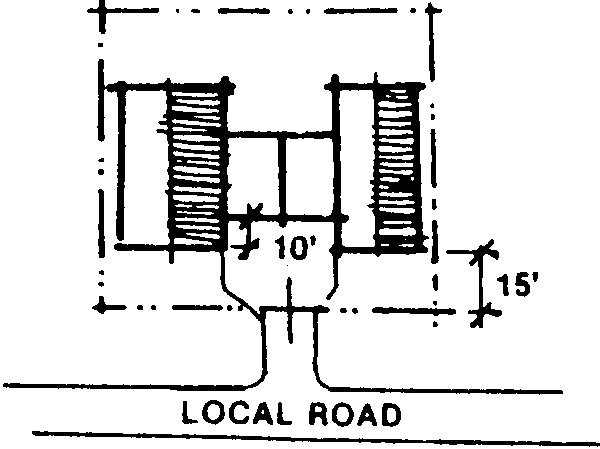 Division of building, parcel or lot. Division of existing buildings, parcels or lots shall not be permitted if the proposed division would create any buildings or lots which do not comply with requirements of this chapter, except for public use lots as defined by this chapter. Areas not satisfying lot area requirements. 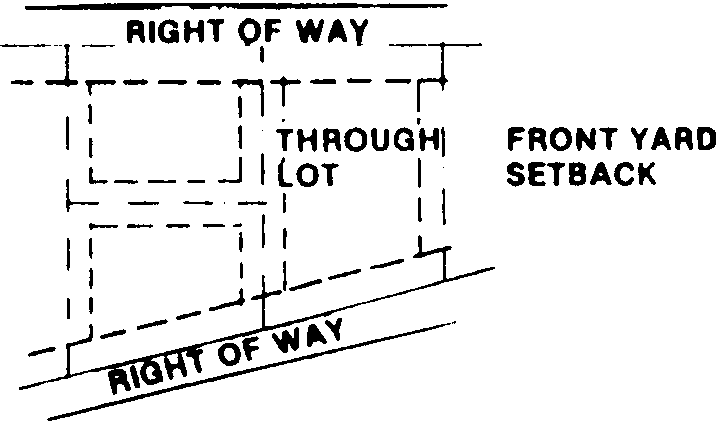 Those areas of a lot which lie in an existing or proposed road right-of-way, except alleys or designated open space, shall not qualify as part of the required minimum lot area. The area within the "handle" of a panhandle lot shall not be considered part of the required minimum area. Minimum residential lot area with private utilities. The minimum residential lot areas provided in this chapter shall not reduce any other prescribed lot size or lot width if a more restrictive requirement exists. The minimum lot areas shall be subject to any additional area required by regulations of the State Department of Health and Mental Hygiene or County law or regulation. The minimum lot frontage shall be 12 1/2 feet. Except in Agricultural Conservation and Rural Conservation Zones, with regard to any parcel, not more than three lots or 5% of the lots intended for detached dwellings, whichever is greater, and not more than 10% of lots intended for attached dwellings may be panhandle lots. From the proposed or established public road right-of-way line. 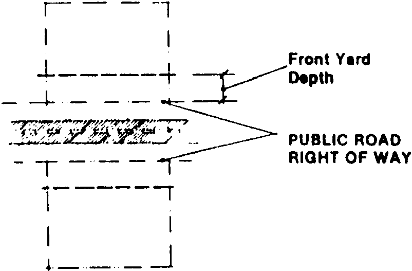 From any private road or access driveway on a line 10 feet from and parallel to the edge of the traveled roadway or 10 feet from and parallel to a line established as a private road right-of-way, whichever is greater. 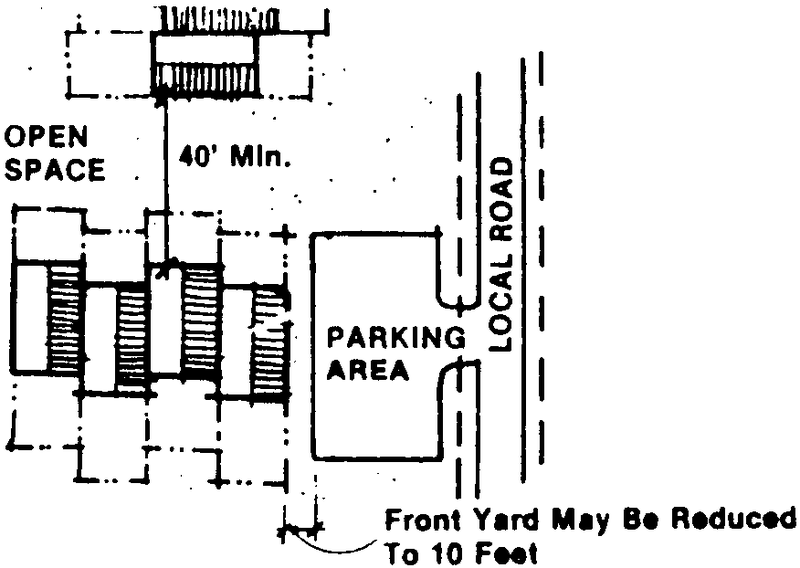 In the case of a panhandle lot not served by an access driveway, the setback shall be measured from the end of the handle and extend across the lot where the minimum front yard setback is met or where the minimum lot width is met, whichever is greater. The setback line shall extend in a straight line from points along the side lot lines which are approximately equidistant from the end of the handle. In the case of a lot with frontage on an existing County road without established right-of-way lines, the setback shall be measured from a line 30 feet from and parallel to the center line of the traveled roadway. 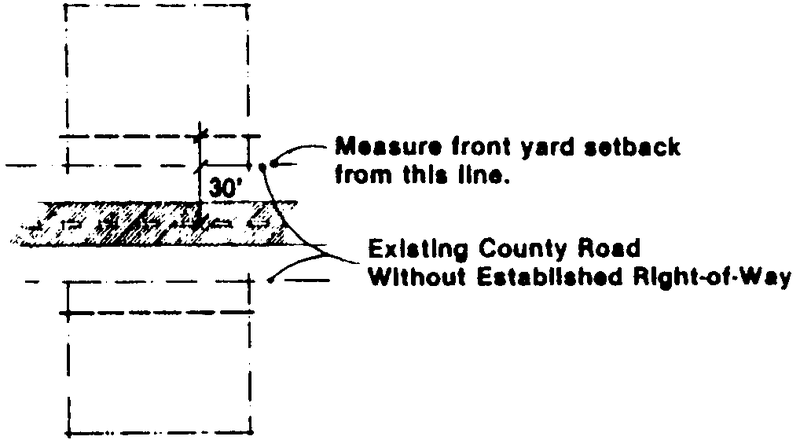 Where a structure is not parallel to the road, the minimum yard requirement may be met by averaging the yard width from one end of the structure to the other end, provided that the yard at the narrowest point is not less than 80% of the minimum yard required by the chapter, not including the reductions permitted by this section. 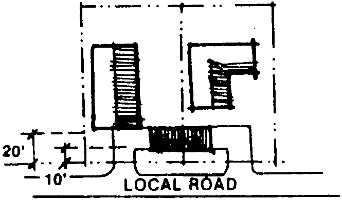 When the average front yard setback of structures located on an existing public road on either side of a vacant lot differs from the minimum setback required by this chapter, such setback on the vacant lot need not exceed the average setback of the adjoining structure or, when only one of the abutting lots is improved, such setback need not exceed the average of the minimum required setback of the zone and the setback of the adjoining structure. In the case of corner lots, a full front yard of the required depth will be provided off both front lot lines, except as otherwise permitted by this chapter. In the case of through lots, front yards will be provided off all front lot lines, except as otherwise permitted in this chapter. Perpendicularly from rear or side lot lines at the closest points to the proposed or existing structure. When measured from an alley, 1/2 of the alley width may be included as a portion of the rear or side yard. For any project without individual lots, the side and rear yards shall be measured along the boundaries of the parcel. Average side yard. The side yard width may be varied where the side wall of a structure is not parallel with the side lot line. In such case, the average width of the side yard shall not be less than the otherwise required minimum width; provided, however, that such side yard shall not be narrower at any point than 1/2 the otherwise required minimum width or narrower than three feet in all cases, except lot line dwellings. Any minor offset, broken or irregular part of a structure which is not the same vertical plane as the portion of the side wall of the structure nearest to the side lot line shall not be included in the computation of the average side yard width. Exceptions and modifications to minimum yard requirements. Awnings, canopies, cornices, eaves or other architectural features; three feet. Bay windows, balconies, chimneys, porches or decks: three feet or as specified in Article XIV, Cluster Development, Figure XIV-2: Schedule of Dimensional Requirements - Cluster Development. Editor's Note: Figure XIV is included as an attachment to this chapter. Open fire escapes or patios (not enclosed): five feet. Uncovered stairs or necessary landings: six feet. Fences and walls in accordance with this chapter. Structures (including but not limited to awnings, canopies, porches, etc.) in the WC and AUC Zones shall be allowed to project into the minimum front setback area in accordance with § 297-97D(4). Structures (including but not limited to awnings, canopies, porches, etc.) in the CRR and CER Zones shall be allowed to project into the minimum front setback area in accordance with § 297-95C(6). Open space or court. When dwelling units are designed to front on open space or a courtyard, rather than a parking area or road, the front yard setback may be reduced to a minimum of 10 feet, provided that the dwelling units are adjacent to a local road and the open space or courtyard extends for the length of the structures and has a minimum building-to-building width of 40 feet. Group parking. When off-street group parking is provided for three or more dwelling units and each dwelling unit is designed without a parking pad or garage, the front yard setback may be reduced to 15 feet for single-family detached and 10 feet for all other dwelling units. Attached garage. When dwelling units are designed with an attached garage and access is provided to a local road, the minimum front yard setback may be reduced to 20 feet for the garage only. Recessed garage and parking pad. When dwelling units are designed with a garage or parking pad which is recessed by at least 10 feet from the front of the dwelling and access is provided to a local road, the minimum front yard setback may be reduced to 15 feet. Parallel garage. 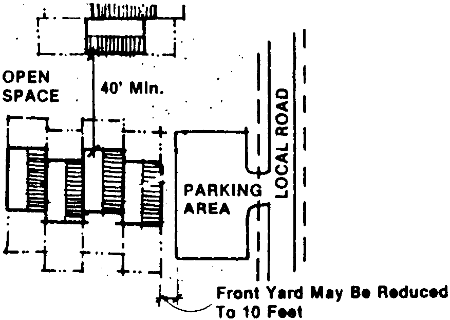 When dwelling units are designed so that the garage opening is perpendicular to the road and access is provided to a local road, the minimum front yard setback may be reduced to 10 feet for the garage and 20 feet for the dwelling unit. Reduced side yards. Where a lot for each dwelling unit is established, the minimum side yard requirements of this chapter may be reduced not more than 30%, when side walls of adjoining single-family attached or semidetached dwellings are offset by 50% or more. Solar orientation. When site plan, landscaping and building units are designed to achieve energy conservation goals and building units are designed for solar collectors or passive solar heating, the yard dimensions of the zone may be reduced to not less than 65% of the minimum yard requirements of this chapter, provided that a shadow plan demonstrating the benefits of the reduced yards and covenants which limit landscaping to protect solar access shall be submitted to justify granting this reduction. Houses of worship, private schools, hospitals or high-rise apartment dwellings, provided that the front, side and rear yards shall be increased not less than one foot for each two feet by which said structure exceeds the height limitation established for the zone in which said structure is located. Fire or parapet walls, towers, steeples, flagpoles, radio and television antennas and silos. 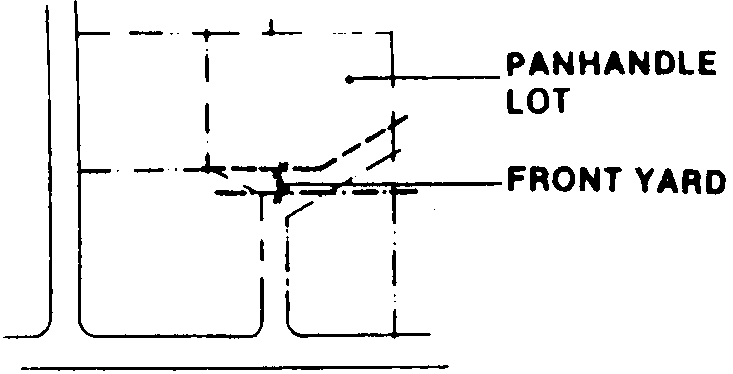 Bulkheads, roof structures, including gable roof systems that do not include approved living space, penthouses, silos, water tanks, monitors and scenery lofts, ventilating fans or similar equipment required to operate and maintain the building, provided that no linear dimension of any such structure exceeds 50% of the corresponding road lot line frontage; or towers and monuments, fire towers, hose towers, cooling towers, grain elevators, gas holders or other structures, where the manufacturing process requires a greater height, provided that all such structures which exceed the heights otherwise permitted in the zone shall not occupy more than 25% of the area of the lot and shall be set back at least 50 feet from every lot line which is not a road right-of-way line. Front yards. For single-family detached units, walls and fences shall not exceed four feet in height above ground elevation. Where fences and walls are an integral part of the unit design and are applied in a consistent and coordinated pattern throughout the project, fences and walls may be constructed to a maximum of six feet above ground elevation. Rear and side yards. Walls and fences shall not exceed eight feet in height above ground elevation. Tennis court fences shall not exceed 12 feet. Security fences for business, industrial or institutional uses shall not exceed 10 feet in height above the elevation of the surface of the ground unless otherwise necessary to comply with screening requirements. Sight triangles shall be required and shall include the area on each street or road corner that is bounded by the line which connects the sight or "connecting" points located on each of the right-of-way lines of the intersecting street. 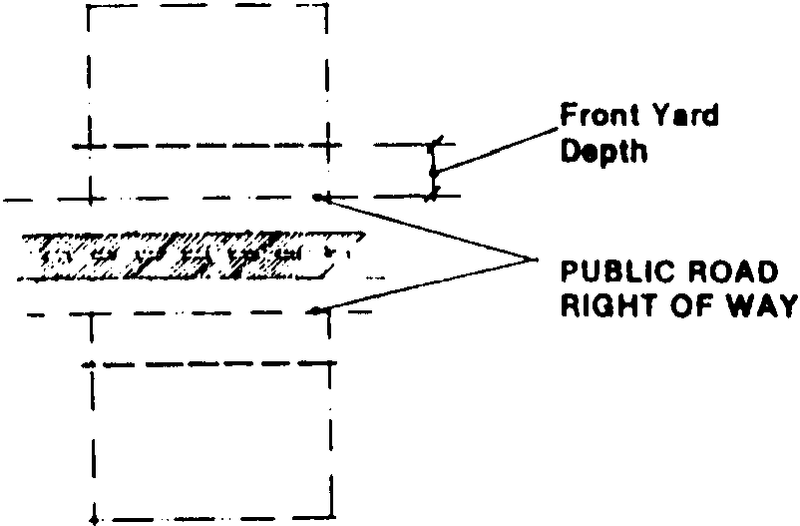 The location of structures exceeding 30 inches in height that would obstruct the clear sight across the area of the sight triangle shall be prohibited, and a public right-of-entry shall be reserved for the purpose of removing any object or material that obstructs the clear sight. The distances shown in Figure II-1 between the connecting points and the intersection of the right-of-way lines shall be required as sight triangles. Except as otherwise restricted by this chapter, customary accessory structures and uses shall be permitted in any zone in connection with the principal permitted use within such zone. In the residential zones and on lots less than three acres in agricultural and rural zones, the area of a single accessory use or structure shall not exceed 50% of the gross floor area of the principal use or structure or 1,000 square feet, whichever is greater. No accessory use or structure shall be established on any lot prior to substantial completion of the construction of the principal structures. No accessory use or structure on any lot shall increase any impervious surface area beyond the maximum permitted. No accessory use or structure shall be established within the required front yard, except agriculture, not including structures, signs, fences, walls or parking area. No agricultural or residential accessory use or structure shall be established within six feet of any side or rear lot line. Business, industrial and institutional accessory structures shall be subject to the same front, side and rear yards as required for the principal structure. No accessory use or structure shall be located within any recorded easement area. An accessory structure which does not abut the principal building shall be located at least six feet from any other building on the same lot. Private horse stables to provide any stables, feeding or bedding areas for two or more horses shall be located at least 75 feet from any public road or lot line. Pastures, when fenced, may extend to the lot line. Wayside stands for the sale of farm products which are grown or produced on-site, provided that such uses are set back a minimum of 20 feet from the public right-of-way, and in no case shall be less than 30 feet from the edge of pavement, and provide at least three off-street parking spaces. Entrances and exits to the required parking area shall be at least 50 feet from any intersection on a local road and 100 feet from all other road intersections. That such vehicles are not used as living quarters or occupied for more than seven days in any ninety-day period. That the location of the parking or storage area shall be in the buildable area of the lot and shall not be in front of the principal structure in the RR, RL, RM or RH Zones. No motor vehicles having a gross vehicle weight of more than 10,000 pounds shall be parked in any residential zone. A motor vehicle having a gross weight of less than 10,000 pounds designed or used to carry freight or passengers for a fee or merchandise in the furtherance of any commercial enterprises shall be allowed in a residential zone on the basis of one vehicle for each residential lot. School buses specifically shall be limited to one such vehicle for each residential lot. Except for trucks used in farming the property on which they are located or trucks used in conjunction with a permitted use, trucks and/or trailers exceeding five tons empty weight shall not be stored or parked in any residential zone unless engaged in moving household goods or making deliveries. No inoperable or untagged motor vehicle and/or vehicle part(s) may be parked or stored on any lot unless such motor vehicle and/or vehicle part(s) are stored within a completely enclosed building or are parked or stored in accordance with all of the following criteria. A maximum of one untagged or inoperable motor vehicle, in accordance with the criteria below, may be parked or stored on any lot. Any untagged motor vehicle shall remain in running condition and shall not be deemed inoperable. "Inoperable" shall be defined as a motor vehicle with any major part, equipment, or component which is necessary for the vehicle's operation removed from the vehicle and not replaced for a period of at least 15 days. Any untagged or inoperable motor vehicle shall be parked or stored on a hard surfaced area constructed of material that will assure a surface resistant to erosion and adequately treated to prevent dust emission. Acceptable hard surfaces shall include, but are not limited to, concrete, asphalt, blue stone, and gravel. Any untagged or inoperable motor vehicle shall be covered by a manufactured vehicle cover, except during active maintenance. No untagged or inoperable motor vehicle may be parked or stored within six feet of the property line unless on a legally established driveway. At no time shall such motor vehicle be parked or stored on any public roadway, common or public parking area, assigned or unassigned. This provision shall not apply to vehicles used in bona fide agricultural operations stored on site. Accommodations for required servants' quarters and guest houses, provided that all front, side and rear yards, lot area and density requirements are maintained. Pens, stalls or runs for animals shall not be located within 50 feet of any adjacent residential lot line. Recreation facilities, such as swimming pools and tennis courts, if the facilities are used by the occupants or guests of the principal use and no admission or membership fees are charged, provided that the edge of the facility, not including security fences, shall be located not less than 10 feet from any side or rear lot line. For community pools and tennis courts, the edge of the facility shall be located not less than 50 feet from any residential unit or side and rear lot line. Storage in a structure on a residential lot. Delivery of inventory or materials is permitted only by the postal service, a private delivery service such as UPS or by the occupant. Traffic shall not exceed three customers or deliveries per day and will not create an increase in traffic patterns normally associated with a residential community. Any parking required is to be limited to off-street gravel or paved parking, on the permit holder's property. Employees are limited to members of the immediate family who reside in the dwelling. Applications for home occupation permits will be approved or disapproved by the Zoning Officer based on the criteria of this subsection. All business activities associated with the conduct of a home occupation shall be conducted entirely within those portions of the principal dwelling that are approved for the home occupation use. All materials, equipment, supplies, and inventory associated with the home occupation shall be stored within the principal dwelling. A home occupation shall not involve the production or improper disposal of any hazardous, toxic, or carcinogenic materials or waste. Editor's Note: This bill also redesignated former Subsection B(18)(e) and (f) as Subsection B(18)(g) and (h). The home occupation shall not operate between the hours of 8:00 p.m. and 7:00 a.m. Business activities associated with a home occupation shall not be conducted on Sundays or federal holidays. Typing or word processing services. Office space for off-site service businesses. Woodcrafting or other home crafts. Automobile sales, repair, dismantling, storage or body shops. Except in the AC Zone, any areas of livestock confinement, manure storage or feed storage erected after the effective date of this chapter shall be a minimum distance of 50 feet from any public street or highway and in no case closer than 250 feet to any existing dwelling units on an adjoining parcel. Storage of petroleum products for on-site consumption, provided that the storage vessel does not exceed 10,000 gallons. A cemetery may be an accessory use when located either on the same lot or on a lot which abuts a place of regular worship, but not a place of occasional worship such as a memorial chapel. Cottage industries shall not be operated on lots of record smaller than five acres. The cottage industry shall be owned and operated by an owner of the property upon which the business operation is conducted. A cottage industry may be placed in an existing structure on an existing farm lot (containing at least five acres) that is adjacent to and under common ownership with an existing lot of record containing the principal domicile of the adjacent farm lot owner. Not more than three persons shall be employed by a cottage industry, not more than one of which may reside off the subject property. Cottage industries may be conducted in an existing rear or side yard accessory structure on lots containing a primary residential structure. Any structure used for a cottage industry shall be completely enclosed on all four sides, and located not more than 500 feet from the owner's primary residence. The structure to be used for a cottage industry also shall be located at least 50 feet closer to the owner's primary residence than to the next closest existing residential structure in the vicinity. Finally, the cottage industry structure shall be located not less than 50 feet from any side or rear lot line nor more than 100 feet from the primary access road. The cottage industry shall be conducted entirely within the designated structure, and the gross floor area dedicated to the cottage industry shall not exceed 50% of the gross floor area of the principal residential structure on the property or the principal domicile on the adjoining lot. A cottage industry may be authorized to utilize one room, containing not more than 200 square feet of floor area, in the principal residential structure or adjoining principal domicile as a business office for the maintenance and processing of records associated with the cottage industry. No business operations, activities, or transactions associated with the cottage industry shall be conducted in any portion of the principal residential structure not approved for cottage industry use by the County. A cottage industry shall not involve the production of any hazardous, toxic, or carcinogenic materials or waste. This restriction shall not be applied to common household cleansers, film-developing chemicals, or medical waste generated and properly disposed by a doctor, dentist, or veterinarian in the conduct of an approved cottage industry. All materials, equipment, supplies, and inventory associated with the cottage industry shall be stored within the designated accessory structure. All power, pneumatic, or hydraulic tools and equipment utilized in the operation of the cottage industry shall be stored and operated within the designated accessory structure. These restrictions shall not apply to a kiln or forge that may be used in association with an approved pottery or wrought-iron handcrafting operation. Any such kiln or forge shall be located in close proximity to the designated accessory structure, where direct visibility from adjoining dwellings or public roads will be minimized. Additional vegetative screening or fencing may be required to minimize direct visibility from adjoining dwellings or public roads. The cottage industry shall not cause or result in any material change in the outside character or appearance of the conforming principal use of the property, with the exception of the erection of one nonilluminated sign advertising the cottage industry, which shall not exceed four square feet in sign area and shall not extend higher than five feet above the ground nor be located less than five feet from the right-of-way line of the adjoining street. If a freestanding sign is not desired, said sign may be affixed to the accessory structure that houses the cottage industry. A cottage industry shall not be permitted in a structure that does not comply with the applicable building codes, fire codes, zoning regulations, or other local, state, and federal regulations. Delivery or shipment of inventory or materials is permitted only by the U.S. Postal Service, a private delivery service (such as UPS, Federal Express, or a similar package delivery service), a customer, or an employee of the cottage industry. Customer and/or shipping traffic to and from the cottage industry shall not exceed 10 trips per day. The cottage industry shall provide at least two, but not more than four dedicated off-street parking spaces to serve the cottage industry. The cottage industry shall not generate any business-related traffic or vehicles that exceed the available off-street parking capacity at any point in time. Any vehicles bearing signs or advertising for the cottage industry shall be parked or stored on the property in a location such that the signs or advertising are not clearly or directly visible from any adjoining street or residences on adjoining properties. Any vehicles that exceed 15,000 pounds gross vehicle rated weight shall require a separate permit from the County. The cottage industry shall not generate any business or customer traffic, nor shall any power, pneumatic, or hydraulic equipment and tools associated with the business be operated, between the hours of 8:00 p.m. and 7:00 a.m.
Any business activity considered suitable as a home occupation. Small engine (lawn mower, motorcycle, moped, etc.) and small electronic appliance repair and servicing, provided the business will have no outdoor displays or staging of inventory. Pottery, glass, art, sculpture, wood-crafting, or other commercial handcrafting operation. Veterinary office to primarily serve a surrounding agricultural community. Personal services, excluding massage parlors, provided that the gross floor area of the proposed use does not exceed 400 square feet. Any manufacturing or industrial processing operations that are not permitted or permitted with conditions in the AC or RC Zones. Automobile or farm equipment sales, repair, dismantling, storage or body shops. Heavy or large engine or machine repair. Medical or dental offices, unless such offices are established and operated to primarily serve a surrounding agricultural community. Commercial kennels or cat boarding facilities. Landscaping, plumbing, or electrical contractor trades. Incidental repair facilities and outside storage of goods normally carried in stock, used in or produced by the business or industrial use, provided that no storage is within 10 feet of any side or rear lot line; all storage is effectively screened from any adjacent residential use or zone; and, such use is not prohibited under the applicable zone regulations of this chapter. Retail sales in industrial zones shall be permitted, provided that the goods sold are manufactured or produced on the site. The use of any tractor-trailer or portion of any tractor-trailer, tagged or untagged, as a storage facility for whatever purpose is permitted, provided that such storage shall not interfere with parking or rear delivery areas or impede the flow of traffic or emergency vehicles in any way. Such storage shall be adequately screened from all rights-of-way and residential properties by fencing or landscaping and shall meet the minimum setback requirements of the zone and any applicable provisions of the Charles County BOCA Code. Nothing in this section shall prohibit the use of temporary construction trailers as storage. Storage of petroleum products for on-site consumption, provided that the storage vessel is not more than 20,000 gallons for commercial zones. There is no limit for accessory storage of petroleum in the industrial zones. The temporary use permit shall specify the use, dates and hours of operation of the event. Adequate arrangements for temporary sanitary facilities must be approved by the County Department of Health. No permanent or temporary electrical power for lighting or other uses shall be installed without an electrical permit demonstrating compliance with the County's electrical code. The site shall be cleared of all debris at the end of the event and cleared of all temporary structures within three days thereafter. A bond or guarantee in a sufficient amount as determined by the Zoning Officer shall be provided to insure that the premises shall be cleared of all debris. For an event of 1,000 or more attendees per day, the bond or guarantee in a sufficient amount as determined by the Zoning Officer shall be provided to insure that all public emergency service agencies will be paid for the provision of agreed upon services. Adequate off-street parking shall be provided and a stabilized drive to the parking area shall be maintained. It shall be the responsibility of the applicant to guide traffic to parking areas. The applicant shall notify the local enforcement authority and shall provide adequate traffic control. Christmas tree displays and sales shall be permitted in any zone for a maximum period of 45 days. Contractor's offices and construction equipment sheds or accommodations for security shall be permitted in any zone if the use is incidental to a construction project. The office or shed shall be removed upon completion of the project. A real estate sales office shall be permitted in any zone for rental or sale of dwellings in the project. The office shall be removed upon initial sales of all units. A rental office may be permanently maintained in a rental project. Wayside stands for the sale of agricultural products, Christmas trees, shellfish, and fish in their unpreserved and natural condition shall be permitted on a seasonal basis, provided that the parcel used has sufficient road frontage to ensure safe ingress and egress. The sales area, including produce stands, shall be set back a minimum of 20 feet from the nearest public road right-of-way and in no case shall be less than 30 feet from the edge of pavement. Entrances and exits to the required parking area shall be at least 50 feet from any intersection on a local road and 100 feet from all other road intersections. Be subject to a building permit approved by the Zoning Officer for the temporary location of a manufactured home. The Zoning Officer may approve the location of the temporary manufactured home for a period not to exceed 60 days beyond the time specified in Subsection F(1)(a) above if a building permit for the new or renovated residence has been issued and construction has commenced. Any extension beyond 60 days shall require approval by the Planning Commission. The temporary manufactured home shall be removed from the property upon completion of the new or rehabilitated residence and issuance of a use and occupancy permit or upon the expiration of the temporary building permit, with extensions, if any, whichever shall first occur. The property owner shall agree, in writing, to remove the temporary manufactured home, in accordance with the provisions of this subsection, prior to the issuance of any building permit authorizing the location of such a temporary manufactured home. Failure to remove a manufactured home in compliance with these provisions constitutes a violation of this chapter. Any sales or trade of goods, wares or merchandise, including but not limited to furniture, clothing, tools, implements, works of art and any tangible personal property of whatever kind, from a motor vehicle or temporary stand, is prohibited, except as provided in this section, or sales in conjunction with a permanent business when such vehicles or stand is located on the premises or adjacent to the premises used by said permanent business, or as otherwise allowed by this chapter. In all zones except IH, no use may emit from a vent, stack, chimney or combustion process any smoke that exceeds a density or equivalent capacity of Ringelmann No. 1; except that, in industrial or commercial zones, an emission that does not exceed a density or equivalent capacity of Ringelmann No. 2 is permissible for a duration of not more than four minutes during any eight-hour period if the source of such emission is not located within 250 feet of a residential zone. In the IH Zone, no use may emit from a vent, stack, chimney or combustion process any smoke that exceeds a density or equivalent capacity of Ringelmann No. 2, except that an emission that does not exceed a density or equivalent capacity of Ringelmann No. 3 is permissible for a duration not more than four minutes during any eight-hour period if the source of emission is not located within 500 feet of a residential zone. For the purpose of determining the density of equivalent opacity of smoke, the Ringelmann Chart, as adopted and published by the United States Department of the Interior, Bureau of Mines Information Circular 8333, May 1967, shall be used. The Ringelmann number referred to in this section refers to the number of the area of the Ringelmann Chart that coincides most nearly with the visual density of equivalent opacity of the emission of smoke observed. For example, a reading of Ringelmann No. 1 indicates a twenty-percent density of the smoke observed. All measurements shall be taken at the point of emission of the smoke. 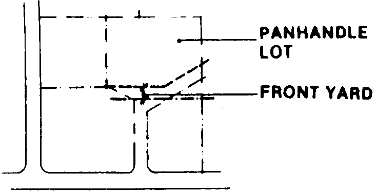 Except as provided in Subsection F, Figure II-2 establishes the maximum permissible noise levels for a use by location, and, as indicated, the maximum permissible noise levels vary according to the zoning of the lot adjacent to the lot on which the use is located. A decibel is a measure of a unit of sound pressure. Since sound waves having the same decibel level "sound" louder or softer to the human ear depending upon the frequency of the sound wave in cycles per second (i.e., whether the pitch of the sound is high or low) an A-weighted filter constructed in accordance with the specifications of the American National Standards Institute, which automatically takes into account the varying effect on the human ear of different pitches, shall be used on any sound level meter taking measurements required by this section. Accordingly, all measurements are expressed in dB(A) to reflect the use of this A-weighted filter. The standards established in Figure II-2 are expressed in terms of the equivalent sound level (Leq), which must be calculated by taking 100 instantaneous A-weighted sound levels at ten-second intervals (see Appendix H) and computing the Leq in accordance with the table set forth in Appendix H. The measurements shall be taken at all property lines of the source of the noise. Editor's Note: Appendix H is included as an attachment to this chapter. Impact noises are sounds that occur intermittently rather than continuously. Impact noises generated by sources that do not operate more than one minute in any one-hour period are permissible up to a level of 10 dB(A) in excess of the figures listed in Figure II-2, except that this higher level of permissible noise shall not apply from 7:00 p.m. to 7:00 a.m. when the adjacent lot is zoned residential. The impact noise shall be measured using the fast response of the sound level meter. Noise resulting from temporary construction activity that occurs between 7:00 a.m. and 7:00 p.m. shall be exempt from the requirements of this section. Any use that emits any "air contaminant" as defined in the State Air Pollution Control Law shall comply with applicable state standards concerning air pollution, as set forth in the Annotated Code of Maryland. No zoning permit may be issued with respect to any development covered by Subsection A until the appropriate state permits have been received by the applicant. No use in any zone may discharge any waste contrary to the provisions of the state law governing discharges of radiological, chemical or biological wastes into surface or subsurface waters. No use may create any electrical disturbance that adversely affects any operations or equipment other than those of the creator of such disturbance; or otherwise cause, create or contribute to the interference with electronic signals, including television and radio broadcasting transmissions, to the extent that the operation of any equipment not owned by the creator of such disturbance is adversely affected. These standards apply to all properties, including storage on railroad property and on chemical company property. A change in use shall require issuance of a new use and occupancy permit. If the change also involves any development activity, any other applicable permits shall also be required. The change involves a change from one principal use category to another. If the original use is a combination use, the relative proportion of space devoted to the individual principal uses that comprise the combination use changes to such an extent that the parking requirements for the overall uses are altered. If the original use is a combination of uses, the mixture of types of individual principal uses changes. If the original use is a planned residential development, the relative proportions of different types of dwelling units change. If there is only one business or enterprise conducted on the lot (regardless of whether that business or enterprise consists of one individual principal use or a combination use) and such business or enterprise moves out and a different type of enterprise moves in (even though the new business or enterprise may be classified under the same principal use or combination use category as the previous type of business). A mere change in the status of property from unoccupied to occupied or vice versa does not constitute a change in use. Whether a change in use occurs shall be determined by comparing the two active uses of the property without regard to any intervening period during which the property may have been unoccupied, unless the property has remained unoccupied for more than 180 consecutive days or has been abandoned. A mere change in ownership of a business or enterprise or a change in the name shall not be regarded as a change in use. The areas where the transportation element of the Comprehensive Plan has been duly approved by the County Commissioners and adopted by the Planning Commission showing a proposed new highway or street or proposed relocation or evidencing of an existing highway or street, no building or part of a building shall be permitted to be erected within the planned acquisition line of such proposed highway or street. That balancing the interest of the general public in preserving the integrity of the place and element and the interest of the owner of the property in the use and benefits of his property, the granting of such permits is required by consideration of reasonable justice and equity. Before taking any such action, the Board shall hold a public hearing at which the parties in interest shall have an opportunity to be heard. All of the general provisions and the specific requirements and procedures related to appeals contained in Article XXV will be applied by the Board in its determination of whether a building permit should or should not be issued. If the Board grants a development permit in any such appeal, it shall specify the exact location, ground area, height and other details as to the extent and character of the development for which the permit is granted and may require reasonable requirements as a condition of granting such permit, which requirements shall inure to the benefit of the County. Whenever the applicant ceases to occupy the structure or lot for which the home occupation or cottage industry permit was issued. No subsequent occupant of such premises shall engage in any home occupation or cottage industry until a new permit has been issued for the proposed business activity. A permit to operate a home occupation or cottage industry is not transferable to a new residence or lot. Whenever the holder of a home occupation or cottage industry permit ceases operation of the permitted business activity for any period of 90 consecutive days. When the owner of a permitted home occupation or cottage industry is issued a notice of violation of this section, the owner shall cease and desist from all business operations until such time as the Zoning Officer has verified, through on-site inspection, that the violation has been remedied. Failure to cease and desist from all business operations, in accordance with this provision, shall constitute a separate violation. If the owner fails to comply with a cease and desist order, or the violation has not been remedied within 30 days of the date that the notice of violation was issued, the home occupation or cottage industry permit shall expire and no resumption of business activities associated with such business may occur without first obtaining a new permit. The two lots cease to be adjoining. 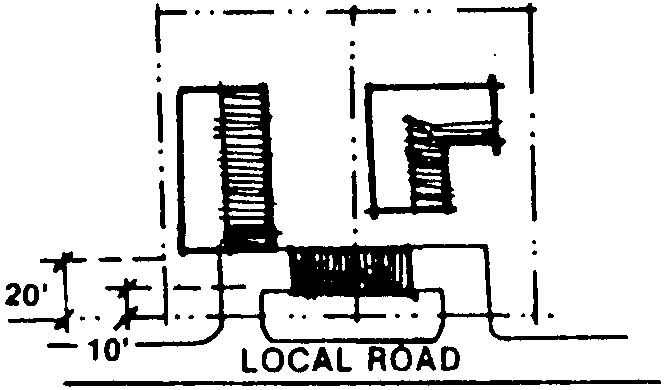 Characteristics of scenic and/or historic roads. A large proportion of the road provides frontage for properties that are in an historic district or subject to perpetual or long-term agricultural, environmental or historic easements. Editor's Note: Appendix J is included as an attachment to this chapter. 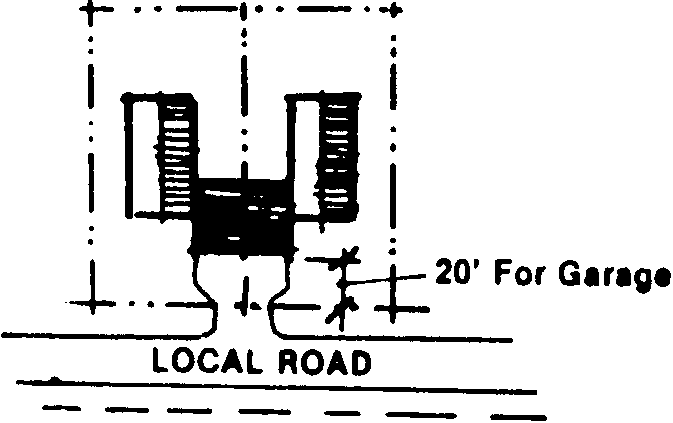 Features of scenic and/or historic roads are features within or adjacent to the right-of-way. The features which contribute to scenic and/or historic character include narrow pavement width, embankments, road alignments which conform closely to natural topography, hedgerows, mature trees or forest along the edges of the roadway, and other features by which the road reflects and is related to the surrounding landscape. Scenic and/or Historic Roads Inventory. Adoption by Commissioners. The County Commissioners shall adopt a Scenic and/or Historic Roads Inventory, and associated maps, which designates certain roads or road segments in the County as scenic and/or historic roads. After adoption of the Scenic and/or Historic Roads Inventory, roads or road segments may be added or deleted by the County Commissioners through resolution or through the update of the Comprehensive Plan. The County Commissioners may include a road or road segment in the Scenic and/or Historic Roads Inventory if it finds that the road has at least one of the characteristics listed in the definition of a scenic and/or historic road in Subsection A(1) above. Include a map of designated scenic and/or historic roads. Appendix J includes the inventory form and methodology used to score and qualify roads for scenic/historic designation in Charles County. The Charles County Commissioners, in their capacity as the chief executive body of the Charles County government, are hereby authorized to modify the methodology from time to time, as circumstances warrant, in accordance with procedures to be adopted by the County Commissioners. Regulations affecting scenic and/or historic roads. See the County's Subdivision Regulations and Road Ordinance for specific design and development criteria applicable to projects adjacent to scenic and/or historic roads.